Editor’s note: Ofer Zalzberg is Senior Analyst for Middle East and North Africa at the International Crisis Group. The views expressed are the writer’s own. In a few weeks, indirect negotiations between Israel and Hamas are to take place in Cairo with the aim of consolidating a durable ceasefire. The problem is that the two sides have two quite different agendas – while Hamas chiefly seeks the removal of the siege over Gaza, the Israeli government is primarily interested in demilitarizing Gaza. But is pushing for demilitarization of Hamas in Gaza alone really in Israel’s interests? The government embraced this objective after important Israeli figures, pointing to Syria’s relinquishing of chemical weapons and the PLO’s 1988 adoption of non-violent resistance, put forward proposals aiming to fully demilitarize the Gaza Strip, including its rockets, missiles and offensive tunnels in exchange for massive economic investments in the Strip. The most prominent of these, advanced by former Defense Minister Shaul Mofaz, offers economic aid for Gaza’s full demilitarization. The Strip’s population would enjoy a massive $50 billion investment over 5 years and sea access via an internationally monitored port in Cyprus. Likud Minister Israel Katz, for his part, has suggested a “civic disengagement" should Gaza be fully demilitarized. This would mean disconnecting any civic or infrastructural link between Israel and the Strip: stop providing electricity, water, fuel and so on in order to end Gaza's dependence on Israel and create a border between Israel and Gaza. In exchange, Gaza would receive sea access via a port on an artificial island under international supervision. Similarly, former GSS Head Yuval Diskin advocated ramping up military pressure on Hamas to force it to accept deep demilitarization in exchange for significant Israeli gestures to improve the lives of Gaza’s civilians. Numerous ministers, including Justice Minister Tzipi Livni, have incorporated this notion in their political plans and speeches. However, these proposals are faulty because they assume demilitarization can be disconnected from statehood – that improving Gazans’ wellbeing would marginalize Hamas, leaving it to choose between abdication or being overthrown by Gazans desirous of a better life. Both scenarios are unrealistic. Most Gazans share Hamas’s view that military capacities are necessary, both to ensure Israel fulfils its commitments regarding Gaza and to liberate, at least, the West Bank and East Jerusalem. Moreover, Gazans hostile to Hamas are unorganized and outgunned by a strong armed movement ready to use force to protect itself. Operation Protective Edge has hurt Hamas, but enfeebled Gaza’s population even more. As Israeli Prime Minister Benjamin Netanyahu’s former adviser Yaacov Amidror has repeatedly stated since the fighting began, if Israel wants to get rid of Hamas, it will have to do it itself by retaking the Gaza Strip militarily. This would entail an enormous cost that Israeli society currently doesn’t want to pay and might trigger violent resistance by other movements and on other fronts. There is a third way, one that would involve rethinking Israel’s policy not only toward Gaza or Hamas, but also toward East Jerusalem and the West Bank. This would aim at ultimately transforming Hamas into a political party in an independent Palestinian state, making Hamas, and other armed factions, subject to its laws on the use of force and invested in the state’s survival. Only when there is a Palestinian state will Hamas actually have to choose between accepting the legal commitments and sovereign nature of the State of Palestine and going to war not only with Israel, but with the rest of Palestine and its Middle Eastern allies as well. Specifically, if the Palestinian state would be established next to Israel based on the 2002 Arab Peace Initiative, then it is likely that both Qatar and Turkey – Hamas’s main patrons, who support the initiative since its launch – will join the coalition pressuring Hamas not to abrogate the peace agreement with Israel. This virtually certainly would be the policy of most of the Arab League members, led by Egypt, Jordan and Saudi Arabia. Like it or not, the demilitarization of Hamas passes through Palestinian statehood. Not because Palestinian statehood would end all violence against Israelis, as some Palestinians would continue to challenge Israel’s very existence. But the aim should be to minimize their number; a Palestinian state could be the most effective way to do so. It would by definition seek a monopoly over the use of force, making demilitarization of Hamas and the Islamic Jihad feasible – not simply by forcible disarmament but also, no less importantly, by integrating those Hamas militants willing to abide by their state’s international commitments and obey its leadership. Palestinians in general and Hamas specifically would then face a choice between working in the interest of their state’s prosperity and continuing a military struggle against a much more powerful Israel and its Arab allies. This approach is also the only way to deal with Palestinian motivations for attacking Israelis, not just with their capacities to do so. A state based on an agreement with Israel, for instance, should have an educational system that could help reduce Palestinian prejudice towards both Jews and Israel – and vice versa. It’s understandable that Minister Katz, who opposes Palestinian statehood for ideological reasons, seeks to resolve the issue of Gaza separately from that of the West Bank. But those like Mofaz, Livni and Diskin, who see the two-state solution as an Israeli national interest, are working against their own goals when they argue that Gaza’s demilitarization could happen without Palestinian statehood. It cannot, and in maintaining that it can, they weaken their own argument in favor of a Palestinian state. The ceasefire reached two weeks ago postponed this and other major issues by a month, giving Israeli opinion leaders enough time to explain to their co-citizens that the two can only happen in tandem. Next entry »Can we defeat the Islamic State? The only way for peace that I can see is for Israel to lift the siege of Gaza. Stop the illegal settlements at the West Bank and stop electing right-wing war mongering criminals like Netanyahu. You are so right and the Palestinian statehood sounds really good. israel will gladly lift the siege of Gaza and will do a lot of other things in full accordance with the terms of the future peeace agreement.... when the Palestinians will convnce Israelis that it is safe to do, of course. Mr. Zalzberg seems to forget that one of the basic conditions of the Oslo Accords was the disarmament of all "armed militias" and "resistance organizations", a condition that Yasser Arafat refused point-blank to fulfill, claiming that it would cause a civil war. I see nothing wrong (Mr. Zalzberg's opinion notwithstanding) with demanding the fulfillment of a condition previously committed to by the PA more than 20 years ago. And the resulting bloodbath in Israel would make ISIS look like Boy Scouts. Remember the era boast that the streets would run ankle-deep in Jewish blood. Or is that your goal? The publicly stated goal of Hamas is the death of every Jew in the world. 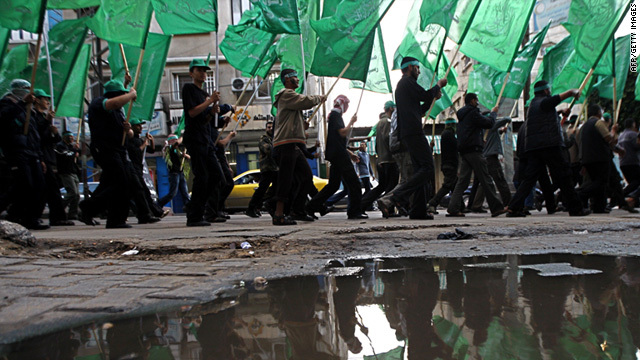 Hamas may prefer the status quo – a government without statehood. Being a sovereign state would only mean lots of obligations. The question is whether Hamas is a mature organisation to take on international responsibilities. Did it occur to anybody, in the Quest for Peace, to demilitarize Israel? Many lives of Innocents in Gaza would have been saved recently by a demilitarization of Israel twenty years ago. Well, it was just a thought I had...I love Peace so much. World Peace, you know. World Peace. Hamas have the choice to be a political polity and provide for the welfare of the Palestinians in Gaza. But they hated Israel more than they love Arabs. You claim you want peace, but if Israel were demilitarized all the Jews there would be murdered by Hamas! My phone was Made in China, so it has no sarcasm button. Lol @ Joey. No sarcasm button. Congratulations, what a great idea. Demillitarizing Israel is certainly a very bad idea. After all, strong Israel is the only guarantee of relative peace in the regiion. Oslo encouraged progress towards disarmament. It was not a condition and it was not about full disarmament. This because full disarmament is impossible before statehood. The eventual solution is forcing the pals to choose between death and pacification. We're one step closer. As easily as certain countries influenced the trade of Fatah with Hamas could be done again could it not? Who is responsible for selling religious fundamentals right wing nut jobs the weapons in the first place . Find those who profit on supplying the weapons , eradicate them and there associates . Look at the similarities of the young men " Khmer Rouge and Islamic State in Iraq and Syria (ISIS). Both were created do to destabilization of a region by a foreign power . Both came to power during American installed puppet regimes . Americas record for installing questionable elected leaders is very poor , the State Department and the DOD are very bad at looking over the resumés of potential dictators . For example ," President Ngo Dinh Diem of Vietnam ", Ferdinand Marcos, of the Philippines," Somoza president of Nicaragua , Augusto Pinochet, dictator of Chile , President Hamid Karzai of Afghanistan , and last but not least , " Iraqi Prime Minister Nouri al-Maliki ". Non actability is the brother of corruption ! I would agree with you @ Thomas, were it not for one simple thing. Many weapons used today were designed by the Israeli's! @Chri$$y... "Many weapons were designed by Israel..." So were the microprocessors in your computer. But hey, if a bandit will use a Henckel kitchen knife to force your wallet from you it would be Germany's fault, correct? I agree with whover wrote this article. Israel will be invaded and occupied, with survivors and POWs sent to slave camps in Uganda. You heard it here first. That scenario of Israel's fate is intriguing. Why would the USA do that? Is it not to the USA's advantage to keep the Arabs as divided as possible so we don't have to negotiate with a single state, a united Arabia, for its oil, dates, and sand? Joey. The USA has never been dependent on ME oil. We get our oil from Canada and Mexico and Venezuela and. Nigeria. A few of our former leaders need control of ME pipeline infrastructures to deliver their personal Caspian Basin crude holdings to China and Ng customer India, is all. Plus we produce over half of our own energy now just like China. The difference is we pay OPEC prices on imported crude. China purchases crude from the Bush-Bin Laden group. Not from OPEC nations. Yes, Joey. That Carlyle Group you and I discussed a couple of years ago. Remember? When you found out that the minimum investment that group accepted was 1 million dollars? And you wished you had a million to invest? Well, that group still retains control of Afghanistan's TAPI, and are trying desperately to retain control of Ukraine's vast pipeline infrastructure even now. It's not East vs. West BS. It's western men hogging profits belonging to other peoples. I still have a lot of work to do before I can play with the really big boys. I'm grateful that I do not resent the success of those who count their money in billions. Never, never give up, Joey©. Off course there are murderous Jews just as there are murderous peoples calling themselves Christ-like individuals. Just as Christ's prophecies said would be the case. Get a clue. People are murderous. That's what I said, La Bella. Most people are religious. Among most people you find murderous Jews, Christians, Muslims, etc. What you said is "Off course there are murderous Jews just as there are murderous peoples calling themselves Christ-like individuals. Just as Christ’s prophecies said would be the case." I said, "Get a clue. People are murderous." Religion isn't necessary to be a person. Religion is not necessary for human beings to kill each other. Why are there so many young males in the world with out jobs , anybody ever here of birth control ? Why would you bring up birth control? In the USA, we pay young, unmarried women to birth babies and raise them to vote. only 3 percent of Palestinians said Gaza was defeated in summer war. this shows the only way to defend ourselves is that all of our compatriots including those living in west bank must be armed. So very true @ Joey, on both counts! Only one flaw in that...it isnt so much that we pay young women to have babies as much as we ignore the young mens responsibility to care for the children theyve helped create! Both birth control and abortions are available in this nation. A woman has the last opportunity to choose abortion, not the father in an undesired pregnancy. If both parents in an undesired pregnancy choose not to abort the fetus, I agree that both parents should commit themselves to the financial responsibility of raising the child. Certainly, the child is not the taxpayers' responsibility, in regard to food, shelter, and clothing. I don`t want to write all of it again, because this site did not take my first version. But it was about, that people should wake up and see the reality, not think, that one simple thing is the cause of anything. How can someone be so ignorant, that he / she thinks, that people, who don`t have even enough of money for their food, could use it for bith control?